Looking for something to do over the Easter holidays? Whether it’s a bright sunny day by the river, or a rainy Sunday afternoon, London’s Design Museum is a great place to hang out and imagine. So when we heard that ‘Hello My Name Is Paul Smith’ is still running, we leave our bikes behind for the day, and take to the river to check it out. It’s amazing how time flies. With almost 50 years in the fashion industry, Sir Paul Smith brings a world of style, daring, and fun to a lot of peoples homes. Not limited to nice shirts, his quiet empire reaches from Nottingham, London, and to some 66 countries around the world. Designing everything from furniture, fragrances, timepieces, and t-shirts. All the same, we come to see how his love for design is also inspired by his passion for cycling, and discover a lot more besides. It’s bizarre; we couldn’t have picked a nicer day to be inside. The sun is out and it’s a pleasant walk across Tower Bridge, looking west along the river towards home. It’s hard to pull yourself away from such a view of old meets new. The Shard may dominate the capital’s skyline, but St. Paul’s still captivates us. We manage to tear ourselves away and sitting in the museum’s cafe, we enjoy a hot drink whilst being treated to a video preview. The opening shot shows Paul Smith riding his bicycle to a catwalk rehearsal he is putting together. 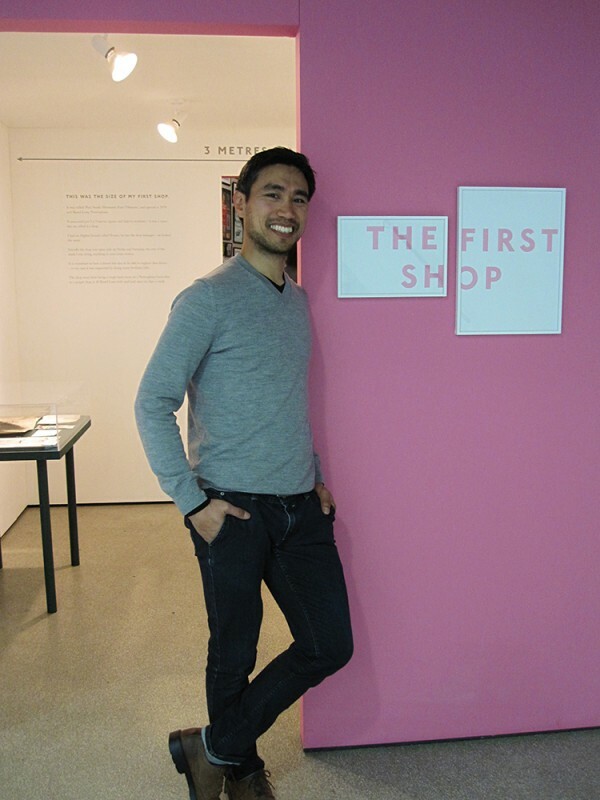 As it turns out the exhibition we have come to see is also organised by the designer himself. As we reach the first floor we are greeted by a box-shaped room. Exploring inside we are astonished to find that this is a replica of Mr. Smith’s very first shop. It’s tiny! Even from modest beginnings, great things can and have happened for Paul. We spend some time enchanted by his closet-sized shop. It clearly holds fond memories for the designer which is apparent by the displays of some of his most cherished times and companions; one of which is a picture of his Afghan hound. We get there just after 11 and we find only the most determined design enthusiasts there, but soon after there is an eclectic mix of families, tourists, designers and students enjoying a feast from a corridor of delights. 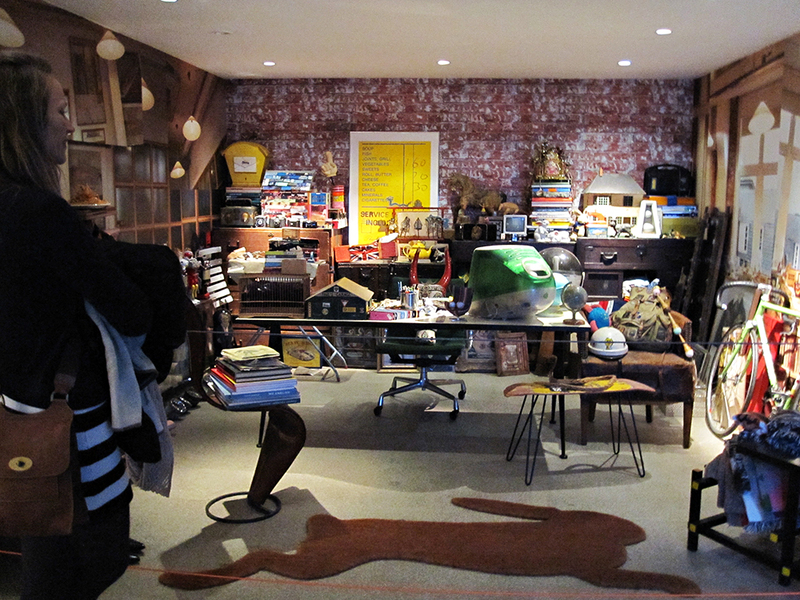 As we go through Paul’s replica shop, the room opens up to a corridor of amazing memories. A collection of Paul’s imaginations printed and hand drawn. A quirky balance comes in the from messages sent to Paul from friends, loved ones and admirers. Of which, there are plenty! We elect to walk down the left side for starters, before entering one of the side corridors that lead us to the wonderful mind of Paul. As funky as it is, Sir Paul Smith, like all successful entrepreneurs manages to combine his passion with quality, expertise and extraordinary delivery. His hotel bedroom during Paris Fashion Week in the early days demonstrates his willingness to take risks and the guts to make it happen. One week, one wholesale order, and the rest, as they say is history! 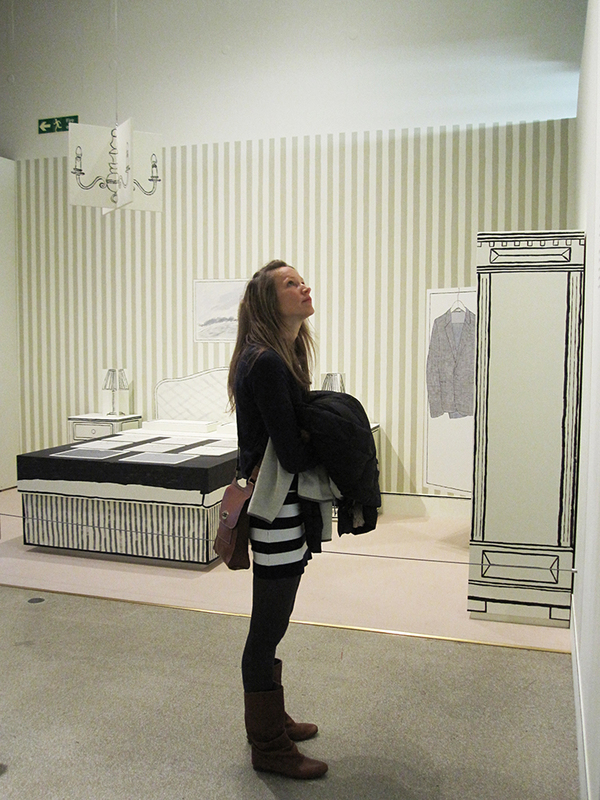 You don’t have to be a fashion fan to enjoy the exhibition either. 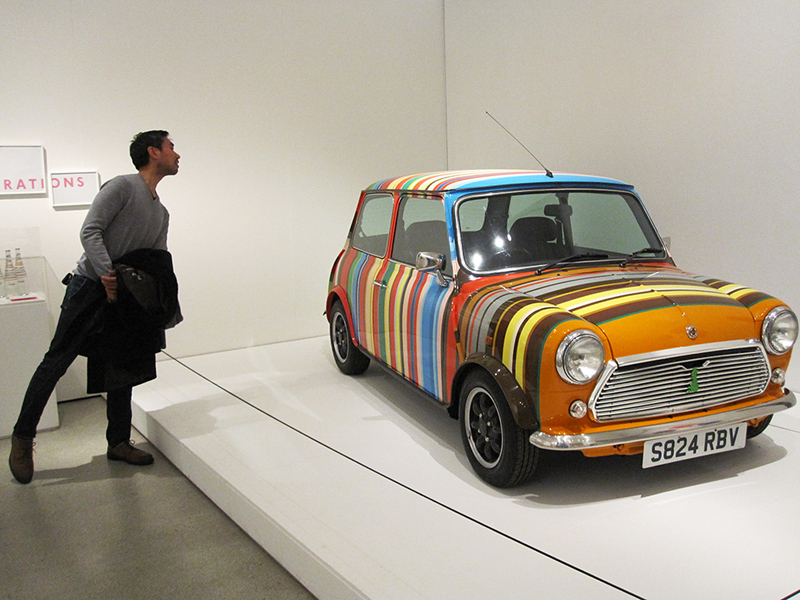 There’s a feast of colourful pieces that makes this museum piece stand out from the crowd. 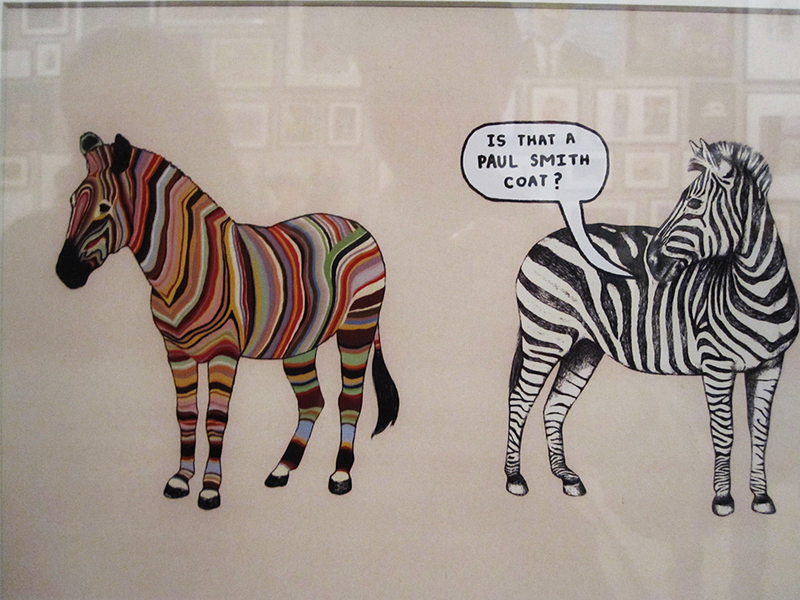 Paul isn’t just interested products, there are zebras; rabbits; pink vacuum cleaners and a bicycle or two. Now, if only every working environment could be put together unintentionally so well. As pleasurable as it is to see a great mind at work through his creations. We can’t help but notice the care, attention to detail and sheer effort put into each piece. Mr. Smith himself talks of how much time is dedicated to colour; contrast; texture and combinations that work right for each of his inspirations. 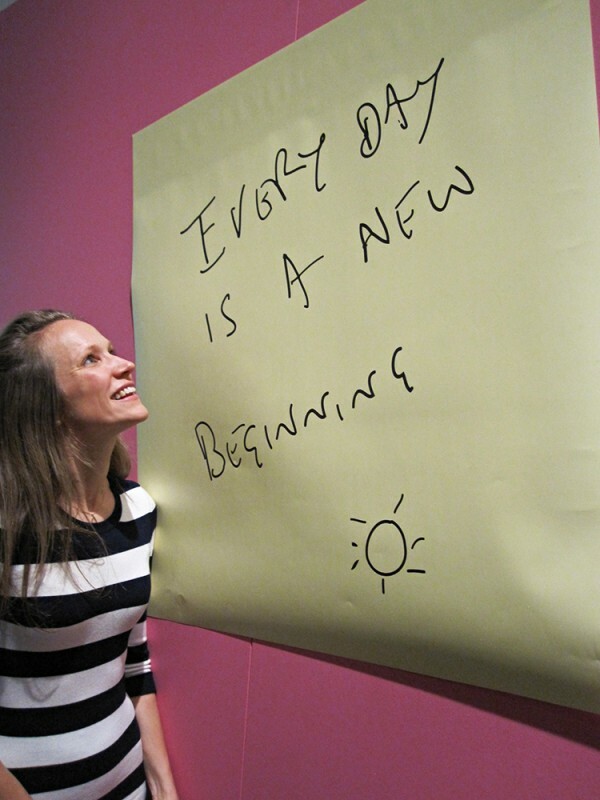 Unforgettable – Paul Smith thanks the Design Museum Team with a little note on the table. Wondering if we could do the Tardis in this colour too. More rabbits. More bikes. Much more fun! Leaving with this message, we can’t help but think we just missed Paul. And that usually he’s here to give everyone a personal guided tour. But hey, you can’t keep the rest of the world waiting. To be this eminent takes much more than talent or great timing. From what we can gather it takes that something truly ‘je ne sais quoi. Something like grit, purpose, heart, and all the fuzzy-fun things that get you back on the saddle over and over again. Although, this isn’t a one man show. Paul Smith also talks with great candour and appreciation, about how this all could not of happened without his wife, Pauline Denyer. From small, humble beginnings, great and exciting things can happen, and do happen for Paul Smith. The exhibition is an unpredictably delicious celebration of Paul Smith’s private and very public life in fashion and dreams. 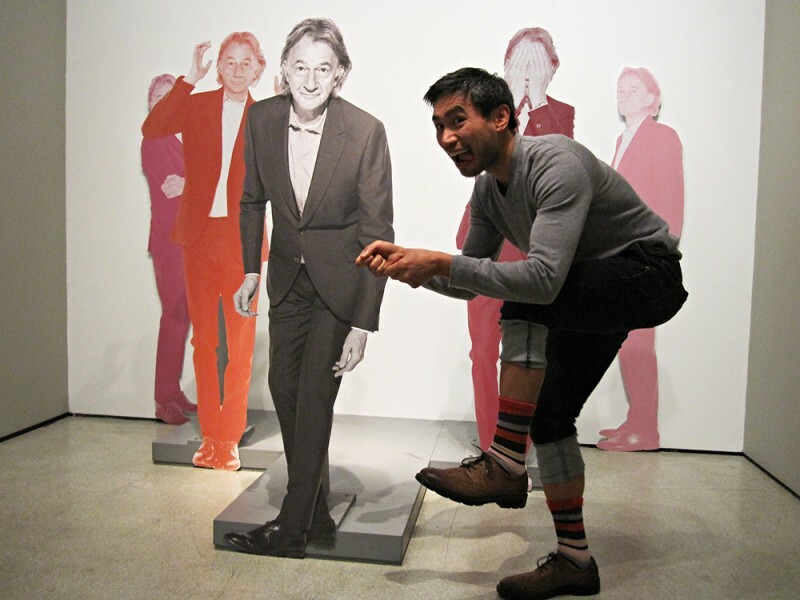 ‘Hello My Name Is Paul Smith’, is currently exhibiting at the Design Museum, London. His creative success is legendary, but his love for cycling is ever present in the celebration of Paul’s quintessential style. 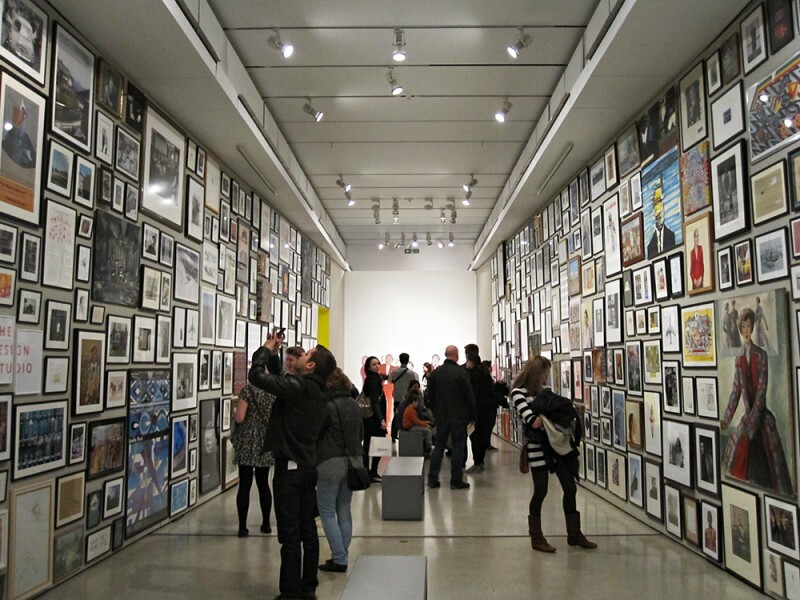 Initially scheduled to run till March 9, his popularity has warranted the showcase to extend till June 2014. Do yourself a favour, and head over for some panache, inspiration and great wit!